Return discount price - economical choice. Lake Balaton is the largest lake in Hungary and in Central Europe. It is one of the foremost regional tourist destinations. It is often called the "Hungarian Sea". The Zala River provides the largest inflow of water to the lake and the canalized Sió is the only outflow. With a surface area of 592 km² has a length of 77 km and a width ranging from 4 to 14 km. The lake's surface is 104 m above sea level, and its depth varies up to 12.2 m (mean depth is 3.2 m). The high tourist season extends from June until the end of August. The average water temperature during the summer is 25 °C, which makes bathing and swimming possible. Most of the beaches consist of either grass, rocks or the silty sand. Other tourist attractions include sailing, fishing and other water sports, as well as visiting the countryside and hills; wineries on the north coast and night life on the south shore. It is possible to visit the lake in winter, when you can go fishing through ice-holes, or, if the ice is thick enough, brave visitors can even skate, sledge or ice-sail on the lake. The Lake Balaton region is well-connected by train and bus. Trains and buses to Budapest leave frequently and take 2.5 hours. Transport to other regional locations is frequent and easy to use. The railway circles the lake, making travel to various towns simple. The Lake Balaton is easily accessible on public road No. 8, 71 and 7, by rail and aeroplane. The airport Sarmallék is located only 25 km. There are scheduled flights from Berlin, Frankfurt, Stuttgart, Copenhagen, Zűrich and London Stansted. The lake is also accessible via charter flights from Hamburg, Düsseldorf, Billund and Moscow. Lake Balaton's summer season is full of activities, including swim competitions, folklore and music performances, beer and wine festivals. Visitors can also participate in waters sports, horseback riding, wine tasting, bird-watching and sightseeing. Health spas are also a part of Lake Balaton's resort atmosphere. There are plenty of things You can do- rent paddleboats, bikes or mopeds. You can swim, sunbath, sail or enjoy one of the many water sports. In the evenings there are parties with concerts on the beach in the „Coca Cola Beach House“ in Siofok, concerts and performances can be seen nearly in every bigger town next to the Balaton. 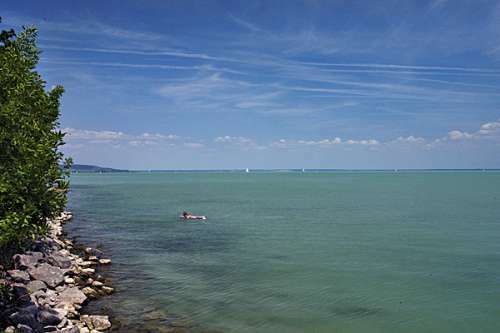 Lake Balaton is the biggest lake in Central Europe (600 km2), it is 77 km long but the water-depth is only 3 meters. This is why it is such an excellent place for a holiday, to swim, to do water-sports and to angle. Angling tourism is normally recommended in the early and late parts of the season. The following fish species can be found in this lake: carp, wels, pikeperch, Volga-pikeperch, asp, pike, eel, grass carp, silvercarp, breams and it's speciality the razor fish. It is possible to fish almost everywhere, but a license is necessary. This can be obtained in any angling shop and in tourist offices. You can angle from the shore, fishing stands (these are usually privately owned), piers or boats. Lake Balaton is primarily a summer holiday destination, but it is an excellent winegrowing region. Around Lake Balaton you will find the Balatonfelvidék, Balatonfüred – Csopak, Balatonboglár and Badacsony wine regions. Badacsony offers delicious white wines like Pinot Gris, Kéknyelű, Italian Riesling, Műller – Thurgau and Tramin. Balatonfelvidék is specialized in Italian Riesling, Chardonnay and Pinot Gris. Balatonfűred – Csopak offers a unique flavour, rich, deep red wines. There are hundreds of cellar and press houses, reflecting a winemaking tradition. There is an official wine route that makes it easy to try the wines of a number of different wine growers in a single day. Four types of landscape meet here: water, mountains, hills and the plain, and in gastronomical terms that means that there are all the basic materials for cooking. The lake has been home to fish, the forests of the hills are rich in game, and in their valleys animal husbandry thrives. On the hills there are fruit trees, while the plain provides cereals and vegetables. Fish is typical on the menu. The white, flaky meat of the pike-perch (fogas) – found only in Lake Balaton – is a particular favourite. It is usually fried and served whole. Fish soup is another classic dish. It is packed with many types of fish. It is also worth tasting game while staying by Lake Balaton. From the expansive forests of the hills, roe deer, stags, wild boar, moufflon and fallow deer, while from the large meadows hare, pheasant, and partridge are available for the table. Venison in red wine with blackcurrant jam and croquette potatoes, or back of hare, hunter’s style, with dumplings are very delicious. Finally, goulash cooked in a cauldron must be mentioned here. Those who come first time from abroad to Lake Balaton should make this dish their first appointment with Hungarian cuisine. You can choose from many types of restaurant but typical for Hungarian cuisine is Csárda. There are plenty of Csárdas on Balaton where you can spend pleasant moments by enjoying traditional tasty of Hungarian food. The Balaton region has a lot of thermal springs. Spa holidays can be taken all year round and make a wonderfully winter break. It´s possibility to employ all of services from massages and mudpacks to physiotherapy and dental work. All these thermal complexes are well provided with spa hotels offering wellness packages. The spa town of Hévíz is the world’s second-largest thermal lake. The lake is open all year. The mineral rich water rarely drops below 26ºC in temperature. The thermal center in Zalakaros is open during the season, and are suitable for the whole family. Zalakaros is recommended for the relief of arthritis thanks to a combination of medicinal baths and generations of expertise. 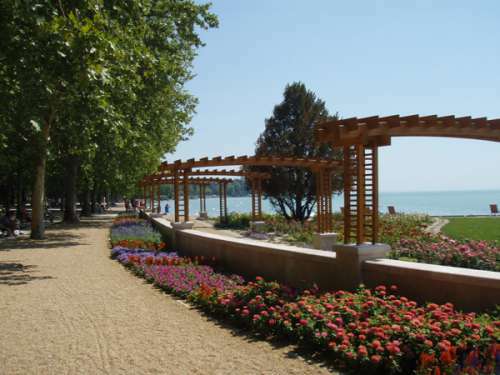 Siofok is the most frequented spa and holiday resort of the southern banks of Lake Balaton. The attraction of the Southern Coast is enhanced by the shallow water and the sandy bottom, which makes it a favourite destination of families. Siofok became a true holiday centre after the Second World War, when hotels nad summer houses were built one after the other. Nowadays Siofok is a tourist and commercial centre and also the centre of fishing and navigation. 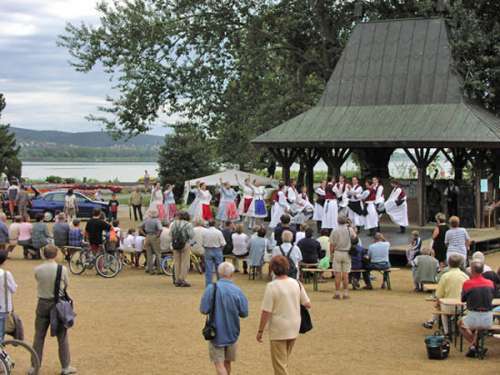 The lively town offers various summer programmes as operett perfomances, organ concerts, historical military, equestrian and folklore festivals, international and local sport competitions, pop concerts and noted international fine art exhibitions. The peninsula of Tihany and its hills, the pearl of the Balaton, rises above the region like a lonely giant or watchtower. Nine centuries ago a church and a monastery were built on the smaller of its hills, and still, it is an important centre of catholic religion. The entire territory of the Tihany peninsula is a protected area, its special sights are the Inner Lake and the abbey. The water of the mineral springs refreshes both body and soul. This idyllic picture is bordered with vineyards heavy with red and white grapes. Stop for a moment and taste the strength of fiery wines of the highland, and try out the echo which has been an inspiration to many poets. 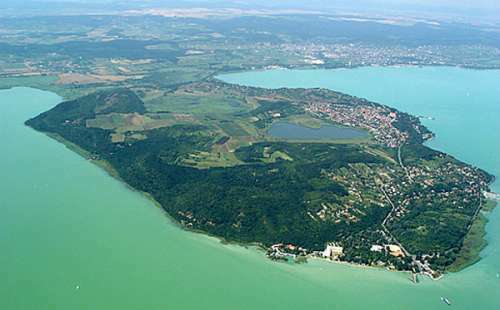 Balatonfüred and its district gives to the tourists natural beauty and special attractiveness. It is a small town with 13.500 inhabitants on the northern shore of Lake Balaton surrounded by the hills of Badacsony. Since 1971, the town has been Hungary’s premier spa resort and the „International Town of Vinces and Wine“. A number of hotels, guest-houses, restaurants, country taverns are waiting for the tens of thousands of tourists who arrive here every year. Besides swimming in the lake and hikes in the countryside a wide selection of different programmes are offered. Now part of the town is also the village Egregy, whith the church which probably dates back to the first half of the 13th century.